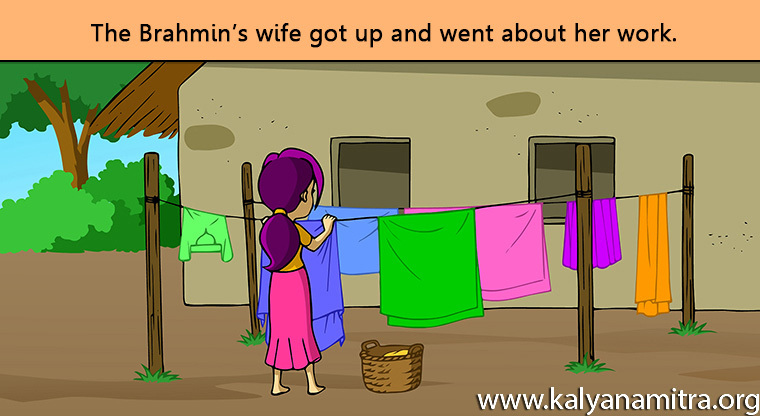 This story was told by the Lord Buddha while was dwelling at Jetavana monastery, about a woman in the city of Savatthi. She is said to have been the wicked wife of a good and virtuous Brahmin who was a lay-disciple. Her nights she spent in gadding about whilst by day she did not a stroke of work but made out to be ill and lay abed groaning. When her husband asked, ‘What is the matter with you, my dear?’ ‘Wind troubles me.’, said she. ‘What can I get for you?’ asked He. The obedient husband did as she wished and toiled like a slave for her. She meantime kept her bed while her husband was about the house but no sooner saw the door shut on him than she was in the arms of her paramours. ‘My poor wife doesn’t seem to get any better of the wind,’ thought the Brahmin at last and betook himself with offerings of perfumes, flowers, and the like, to the Master at Jetavana monastery. His obeisance done, he stood before the Blessed One who asked him, ‘why have you been absent so long, my son?’ The Brahmin explained the reason of having no time to pay a visit to the Master. Said the Lord Buddha who knew the wife’s wickedness, ‘Ah! Brahmin, the wise and good of days gone by taught you how to physic a woman suffering like your wife from so stubborn an ailment. But re-birth has confused your memory so that you forget.’ So saying, He told the following story of the past. Terrified by this, the woman Kosiya realized from the moment the master interfered how impossible it was to deceive him and getting up, went about her work. And the consciousness that the master knew her wickedness made her repent and become as good as she had formerly been wicked.